Click here or click the image to the right to read a brief history of Hampton. Old Hampton in NH - a detailed article about early Hampton from the 1896 issue of New England Magazine. 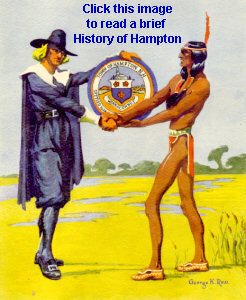 For more information about the history of Hampton, see our Links page. Within easy walking distance of all our elementary schools, we have worked with teachers and designed programs for grades 1-3, and 8. "Ox Cart Man" - First graders walk to the museum and listen to a book written by a New Hampshire author Donald Hall read by a costumed interpreter. After the story they go on a scavenger hunt to find the items mentioned in the story. This program offers geography, history, for many first graders it is their first visit to a history museum and we hope it helps them gain pride in their community. At right, "Goody" Moe explains her dress to first graders. Tuck's Traveling History Trunk - A costumed interpreter goes into the classroom as "Goody Moulton" where unpacking her trunk, she talks about her ocean voyage and shows what types of food and equipment the settlers brought with them from England to start their new life. Students learn about the first settlers in Hampton, and what their trip from England may have been like. 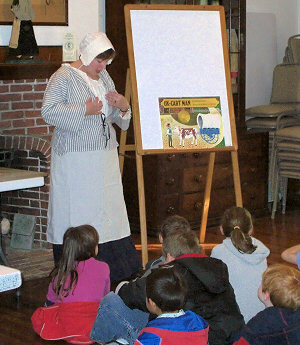 New Hampshire history is part of grade three curriculums. 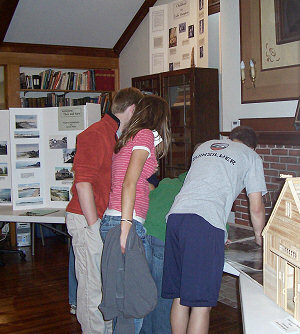 Students visit the museum where four education stations are set up around the property-Founders Park, the Schoolhouse, the Farm Museum and the main museum. They learn who settled here, when and why they chose this area, what it was like to live here, and who was here before the English settlers arrived. In the 1850 district schoolhouse they learn what it was like to be educated here in the 1800s. 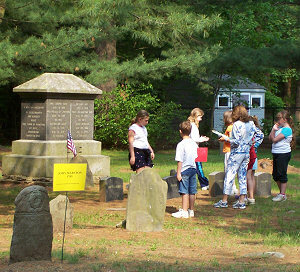 At right, 3rd graders from the Marston school at the Pine Grove Cemetery, learning about residents of early Hampton. 8th graders visit the Tuck Museum after studying 20th century American history. At the museum, they learn how local residents played a part in community and world events. At right, 8th graders from Hampton Academy study the aerial maps of Hampton to see how the community changed and developed since WWII. We see home-schooled groups, Scout groups, and high school students doing research. By the end of each year we have had 600-800 students, teachers, and parents who have participated our programs. We also try to emphasis that we are all volunteers, how much we enjoy what we do, and how important it is to be active in our community. There are three to four programs a year regarding local history. Graveyard tours, Exhibit Openings, Holiday Members Open House are other ways members, friends, and visitors are able to enjoy the museum. 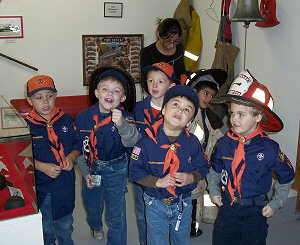 Guided museum visits can be arranged and designed around the interest of groups and organizations. The grounds can be rented out for family reunions and other events. Contact us at 603/929-0781 for details and rates.